We offer a special free license type for educational use - like classroom training and similar scenarios. These licenses may be installed on your students' personal computers for the duration of the related class / course - or permanently on institution owned computers. 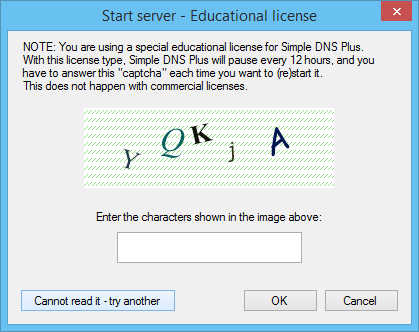 Note: This license type is not valid (or suitable) for running an educational institution's general DNS servers. For this you will need a regular license (we do not offer educational discounts for this purpose). Note: This license type requires Simple DNS Plus v. 5.2 build 132 or later.